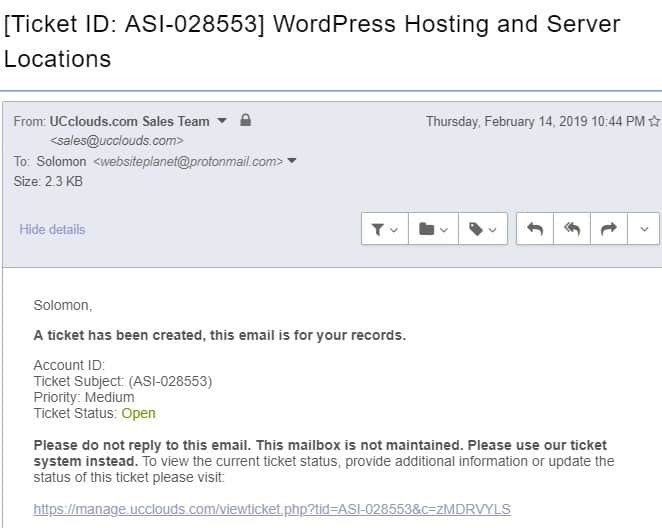 UCclouds.com Review 2019: Is UCclouds.com a Good Hosting? UCclouds.com was established in 2001. At the time, the vendor did not have a lot of resources needed to offer quality hosting solutions. But over the years, it has become a notable web hosting company offering cloud-based hosting solutions to businesses in the U.S. and beyond. UCclouds.com is an IT company based in Atlanta, Georgia in the United States. Established in 2001, the vendor’s solutions align with its slogan: “Everything UC is in the Cloud”. They include cloud computing, desktops as a service (DaaS), customized cloud infrastructure, application hosting, managed server hosting, and VoIP. All these are backed by 24/7/365 technical support. UCclouds.com’s servers are housed in cutting-edge data centers located in Atlanta, Seattle, and London. The data centers are equipped with redundant internet connectivity, redundant cooling systems, and robust security systems for more reliability. The vendor uses cloud-based servers powered by VMware, making it possible for them to record optimal performance. What’s more, they are Cisco UCS Blade servers equipped with Infiniband connection providing faster network connectivity. UCclouds.com servers use NetApp data storage systems. The data storage comes with storage technologies such as deduplication, failover, and high availability datastore clustering to help you achieve your storage demands. For customers who require advanced data backup services, this hosting provider offers UCclouds Data Protection Suite™, an award-winning managed backups technology that delivers near-continuous data protection with built-in replication. It also delivers up to 50 times faster offsite backups than standard backup technologies. Customers can store and retrieve up to seven most recent nightly backups and upto 10 weekly backups. The prices of UCclouds.com hosting plans are pretty standard. They come with flexible billing cycles and clients can commit to a contract of at least one month. What’s more, the vendor promises discounts of up to 40% off the monthly fee when you commit to longer contracts. 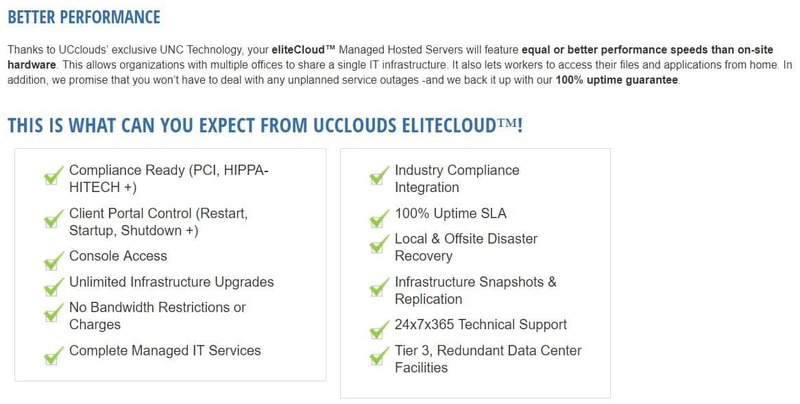 UCclouds.com offers a 100% uptime guarantee as well as a 100-day money-back guarantee. Clients can contact UCclouds.com’s U.S. based customer support via telephone, email, or ticketing system. While the vendor claims to offer live chat support, the live chat icon on its website is invalid. Although it claims to offer 24/7/365 support as well, the reality is somewhat different. I opened a ticket and received an automated response, but the vendor never responded to my query. UCclouds.com has a pretty detailed knowledge base that includes video tutorials. However, I encountered errors when I tried to open the videos. 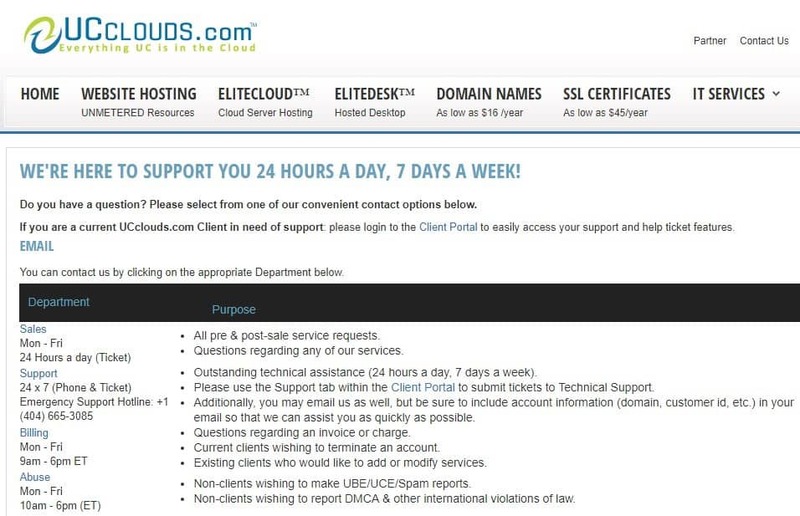 While UCclouds.com’s investment in cloud hosting solutions is noteworthy, it has not invested substantially in its support department. For users who would be dependent on help from this vendor’s support team, this reality can be frustrating. All the same, for business enterprises that have the necessary expertise to deal with most of the hosting challenges they might face, UCclouds.com can be ideal. Wondering how UCclouds.com stacks up against other Web Hosting companies? Enter any other Web Hosting company and we will give you a side-by-side comparison.